The global microfluidics market is highly consolidated with the dominant presence of three global players. The leading players — Danaher Corporation, F. Hoffman-La Roche AG, and Thermo Fisher Scientific — collectively accounted for a global market share of 53.0% in 2016, states Transparency Market Research (TMR). The top companies offer a diverse product portfolio. They are focusing on the expansion of their geographic presence to consolidate their market shares. Prominent players are launching innovative products for a wide spectrum of applications, including low-cost point-of-care testing, in medical diagnostics, drug discovery, and therapeutic devices. As per the TMR’s estimation, the global microfluidics market is anticipated to rise at a CAGR of 11.4% during the period 2016 – 2025. 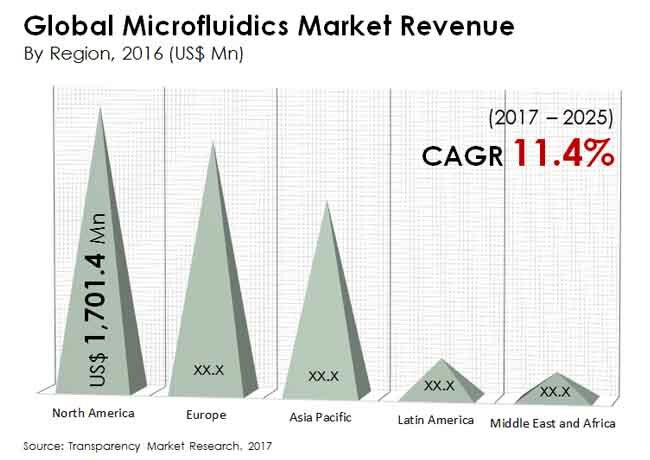 The global market for microfluidics was valued at US$ 4.76 bn in 2016 and is expected to attain a size of US$12.45 bn by 2025. North America is expected to lead the global market and is forecast to acquire a share of 35.4% during 2017- 2025. Growth witnessed in this regional market is propelled by the advent of a range of advanced technologies related to point-of-care testing and the soaring demand for in-vitro diagnostics. Asia Pacific is expected to clock impressive growth in the microfluidics market through the forecast period. The introduction of portable and low cost microfluidic platforms in point-of-care testing in various developing countries of Asia Pacific is expected to unlock enormous opportunities for the market players to capitalize on. Based on products, the global market is segmented into microfluidic chips, instruments, cartridges and reagents, and others. Among these, the cartridges and reagents segment is expected to dominate the market. The growth of the segment is fuelled by the wide applications of cartridges and reagents in assays and techniques due to enhanced accuracy, quick analysis, and economical reagent consumption which brings down the cost. Advancement in microfluidic platforms has significantly lowered the costs of diagnostic procedures, ensured lesser use of reagents, and enabled smaller size of medical devices. The demand for low-cost microfluidics in point-of-care diagnosis of various chronic diseases such as diabetes, cardiovascular ailments, and cancer has bolstered its demand in different developing regions, particularly across emerging markets of Asia Pacific. The rapidly growing geriatrics population who require fast and accurate diagnosis, coupled with continuous technological advances, in the areas of genomics and proteomics have spurred the demand for microfluidics across the globe. Several market players are using polymers in the manufacturing process of different microfluidic products which is expected to considerably reduce the manufacturing cost. On the other hand, stringent approvals by global regulatory agencies, such as the U.S. FDA, for microfluidic devices and the high cost of instruments are likely to hinder the market growth to an extent. In addition, the limited reliability and packaging of these microfluidic devices is expected to adversely impact the market. Nevertheless, dynamic collaborations between several global players and innovative methods of drug delivery are factors expected to impel the demand for microfluidic platforms and technologies. The study presented here is based on a report by Transparency Market Research (TMR), titled “Microfluidics Market - Global Industry Analysis, Size, Share, Growth, Trends, and Forecast 2017 - 2025.